The building has 3 floors and 2 intermediate floors and it is oriented with an axis of 10º, with the main façade oriented to West.The external walls are made of stone masonry and have a thickness of 90 to 145 cm. All the windows and balcony doors are of single glazing with wood frames. A thermal survey made in the building showed that walls present a good thermal performance but the windows, with single glazing with wood frames, present insulation problems, aggravated by aging, contributing to high heat losses during winter.The building does not present major pathologies, such as condensations or mould growth. The Municipality has no financial plan to improve this specific building, with the exception of the roof whose intervention was already planned. The Municipality is trying to raise funds from national and European funding programs. Coimbra – part of the historic city center, older University buildings and other urban structures – is since June 22th 2013 inscribed on the World Heritage List of UNESCO. The Property inscribed is called University of Coimbra — Alta and Sofia (http://worldheritage.uc.pt/). The Coimbra Town Hall is included in this area and therefore strong restrictions are applied in the renovation of such building due to the protection rules. Therefore, it is not possible to implement any change in the building envelope able to cause any visual impact. The building is located in the downtown of Coimbra and it was built after the demolition of part of the old Monastery of Santa Cruz. The demolitions works and construction was carried out mainly between 1876 and 1879, but some construction works were developed gradually until the beginning of the 20th century. The building is used as the town hall of the Municipality of Coimbra, being mainly constituted by offices and storage areas.Brief video presentation: https://www.youtube.com/watch?v=IrsS95cpta4 The building usually has occupation between 7h30 and 19h30 (Monday to Friday). However, the public only have access between 9h00 and 17h00. The building has 220 employees and is visited by more than 25,000 users/year. Regarding the insulation, the walls present a good thermal performance. The roof is to undergo an already planned renovation soon. Therefore, the improvement of the opaque envelope was not considered in the renovation plan.The windows present high thermal losses. However, since the building is part of the property “University of Coimbra — Alta and Sofia” inscribed on the World Heritage List of UNESCO several strong restrictions are applied in the renovation of such building due to the protection rules and it is not possible to implement any change in the building envelope that causes a visual impact. Therefore, it is not possible to replace the windows by double glazed windows using standard solutions, since the original frame must be maintained. The HVAC system is constituted by 8 multi-split units and 21 mono-split units with a total cooling power of 273.02 kW. Most of the systems are old and are most likely to have low levels of efficiency. The replacement of mono-split systems by multi-split systems and the concentration of multi-split systems in less units was not considered, since the impact of the installation process on the building operation would be much higher. Therefore, it was always considered the replacement by systems of the same type, but with higher efficiency, keeping the same total power. The actual lighting system is constituted by several different types of lamps and luminaires, including fluorescent linear T8 and T5 lamps, several types of compact fluorescent lamps, incandescent lamps, halogen spots and projectors and metal halide lamps. The planned action is to replace all lamps by LEDs. Since the building is part of the property “University of Coimbra — Alta and Sofia” inscribed on the World Heritage List of UNESCO several strong restrictions are applied in the renovation of such building due to the protection rules. Therefore, the use of traditional PV panels was not considered due to its high visual impact. Therefore, it was considered the use of solar tiles, to replace the actual roof. It was considered the installation of 2,102 m2 (with the different directions of the roof) of thin film PV panels, ensuring an installed power of 126.1 kWp. This will ensure a generation of 143.3 MWh/year. 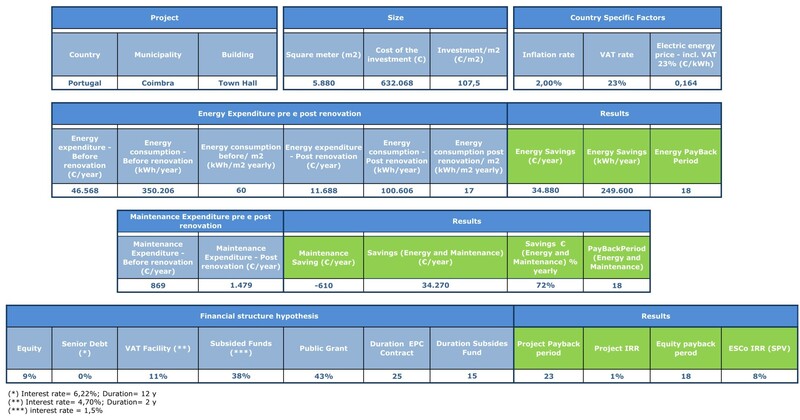 The energy consumption before the renovation, considered as baseline, is equal to 305,107 kWh/year (electricity) and the energy consumption by square meter is about 51.9 kWh/m2. After the renovation the energy consumption drops to 55,508 kWh/year (electricity only) and the energy consumption by square meter is equal to 9.4 kWh/m2. Which means 42,739 Euro/year of savings. The renovation will lead to 72.1% savings in the building. The savings resulting from the PV system, lamp replacement and HVAC replacement by others with higher efficiency are equal to 34.92 tons/year. The project payback period is close to 17 years This payback is calculated without considering the Financing Scheme. The technical investment cost is equal to 632.068 Euro (excluded VAT), which means the investment cost per square meter is 107.5 Euro/m2. 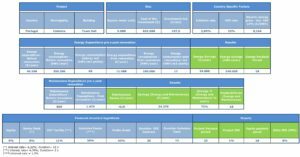 In this case, the project generates enough cash flows to pay the debt but it is not able to remunerate sufficiently the capital invested by the ESCo. As a consequence, an ESCo intervention at market conditions should be considered sustainable but not profitable enough.